This live performance by Biz Markie, DJ Grandmaster BMC and MC Chilly Dawg (of Groove B. Chill), and Kid Wizard Rakim was ripped from a tape owned by Long Island MC/DJ Oxygen and uploaded to the Old School Hip Hop Tapes blog by that site's owner, Dutch. Much respect due to both of them for preserving this piece of Long Island hip-hop history. To help ensure that it doesn't get lost in dead link land, I've taken the (off)liberty of re-ripping Dutch's stream and posting it to Soundcloud, so now you can once again download the performance audio by going to https://soundcloud.com/longislandrap/biz-markie-rakim-wyandanch-1985. Rakim gets on the mic at the 5:06 mark and drops his famous "7 MCs" line at 6:55. 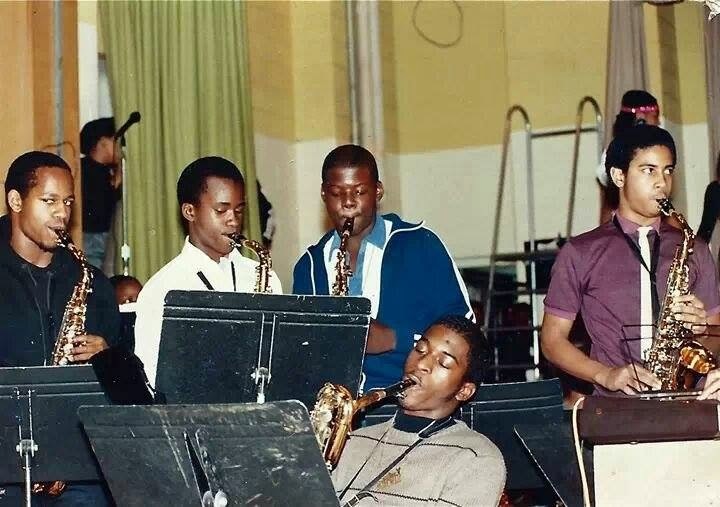 As for the picture above, that's Rakim, front and center, playing the baritone saxophone at Wyandanch High School. (I wish I had some recordings of that too!) The photo comes to us direct from the Facebook page of Ra's classmate Daniel Quintana, who appears in the back right.